a museum dedicated to Florence Nightingale, founder of the Florence Nightingale School of Nursing and Midwifery at King's. 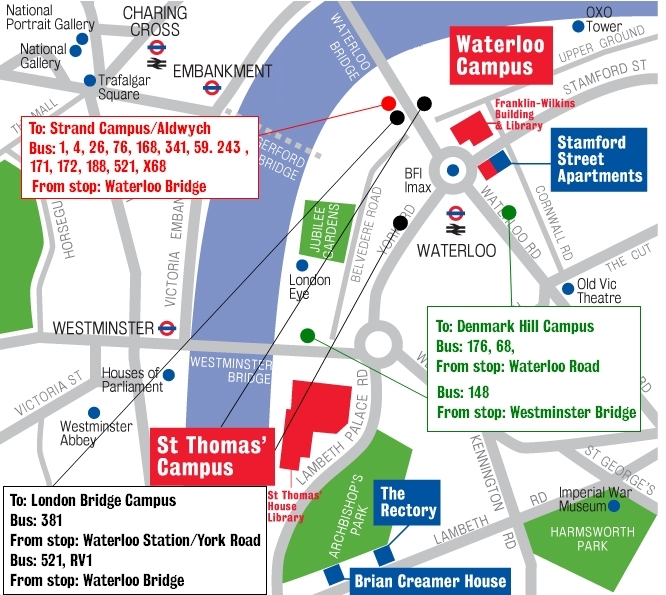 The Campus is located in central London, overlooking the River Thames, next to Westminster Bridge and opposite the Houses of Parliament. St Thomas' is just five minutes walk along the river from the Waterloo Campus. Lambeth North (Bakerloo line): 7 minute walk, Waterloo (Bakerloo, Jubilee, Northern and Waterloo & City lines): 10 minute walk, Westminster (Circle, District and Jubilee lines): 11 minute walk. Stopping at Westminster Bridge Road - 12, 53, 148, 159, 211, 453, C10, N44, N155, N159, N381. Stopping at Lambeth Palace Road - 77, 507, N44. Stopping at York Road - 76, 341, 381, RV1. Stopping at Lambeth Road - 3, 344, C10, N3. at Guy's Campus, on Great Maze Pond on the lay-by to the Bloomfield Clinic. 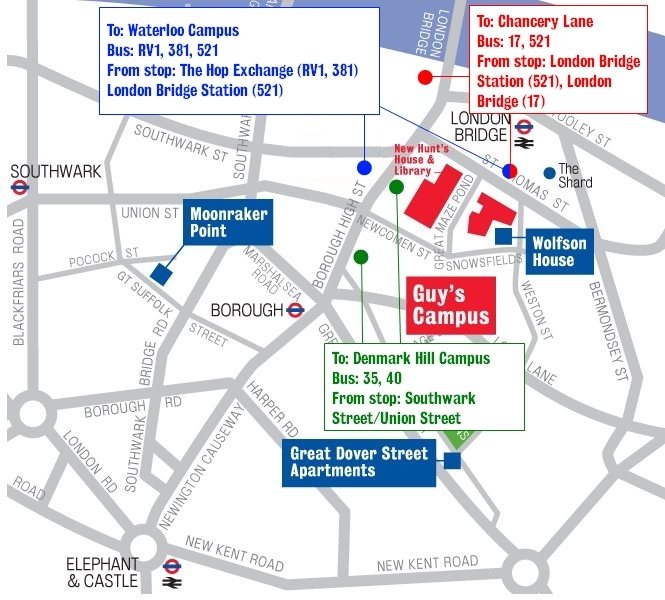 Waterloo, Waterloo East, Victoria and Charing Cross are the nearest railway stations, and a 15 minute walk away. From the west, Putney - Blackfriars: get off at London eye (Waterloo) Pier. From the east, Woolwich Arsenal - Savoy: get off at London eye (Waterloo) Pier. Bicycle racks are located along side Gassiot House and next to the Florence Nightingale Museum, both areas are covered by CCTV. From the IMAX head towards the National Theatre, turn left on to Belvedere Road and continue until Westminster Bridge Road, and follow round to the left and then right on to Lambeth Palace Road. From the IMAX head towards the Royal Festival Hall, from there take the RV1. Bus stops near Waterloo Campus. From Waterloo take the Jubilee line to Westminster, exit and cross Westminster Bridge. Head down Surrey street toward the river, turn right on to Victoria Embankment and continue until Westminster Bridge Road. Cross the bridge and turn right on to Lambeth Palace Road. Take the 1, 4, 172, 26, 168, 243, 68, 171 or 59 to Waterloo, then change to the 507. Bus stops near Strand Campus. From Temple take the Circle or District lines to Westminster, exit and cross Westminster Bridge Road. From St Thomas’ Street turn left on to Borough High Street, then take the second right on to Union Street. Continue along Union Street, crossing over Southwark Bridge Road. Cross Blackfriars Road and continue along The Cut, then cross Waterloo Road and continue along Baylis Road. 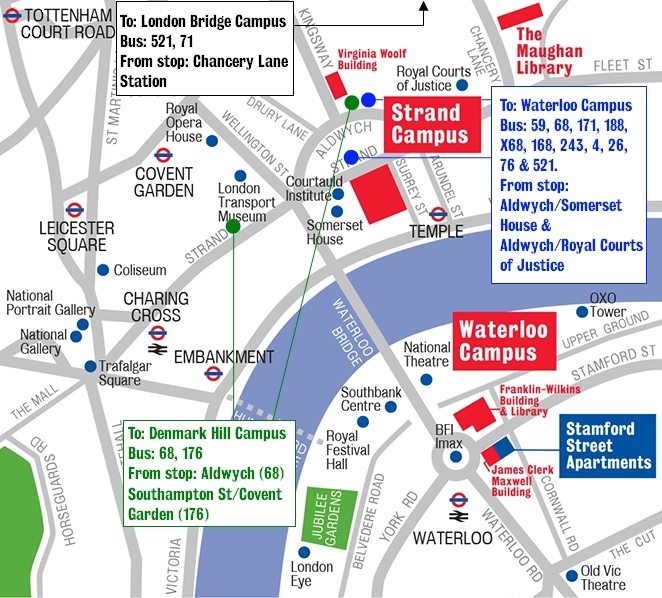 Take the fourth right on to Westminster Bridge Road and then third left on to Lambeth Palace Road. Take the 381 to Waterloo and then the 77 or 507. Bus stops near Guy's Campus. From London Bridge take the Jubilee Line to Westminster, exit and cross Westminster Bridge. n/a Take the 12 or 148 to Camberwell Green. 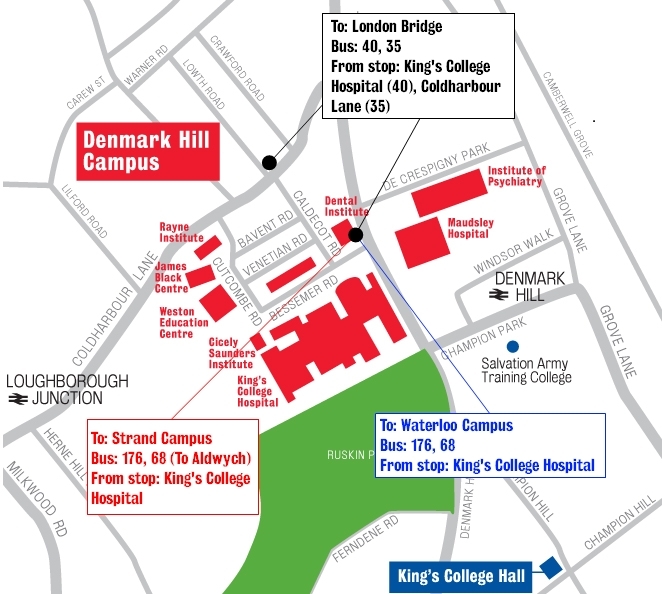 Bus stops near Denmark Hill Campus. Take the 12, 53 or 158 to Elephant & Castle, then Thameslink to Denmark Hill Station.